Your options are almost endless, the procedure is simple and the results impressive. Generally infusing in two to five days, this project is also red carpet worthy, and great for those soiree invitations when you desperately need inspiration for what to bring. 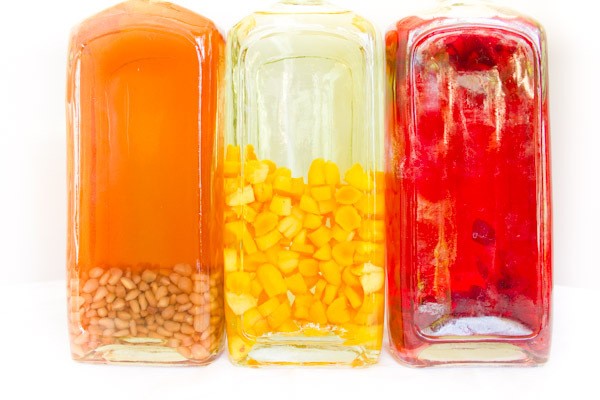 Clean glass containers: mason jars, empty wine bottles, apothecary jars, hermetic jars, etc. Just make sure they are very clean and free from any residue or odor of what was in them previously. Alcohol base: Vodka is most common, primarily due to its somewhat neutral flavor. However, light or dark rum, gin, and tequila also work great. I have tried it with 100 proof vodka, instead of the more common 80 proof, and found the higher alcohol content was too aggressive to experience any of the flavors in any pleasant way. 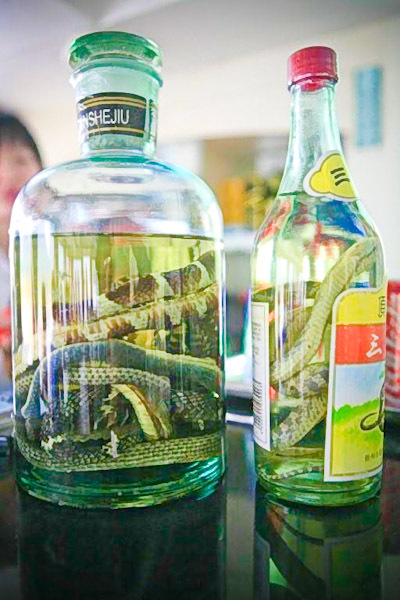 Since you will be flavoring it, and probably experimenting some, I don't think it is necessary to break the bank and buy super high end alcohol, at least until you find a combination you love. But along with that, the better the ingredients, alcohol and flavors, the better the product, and lousy vodka is just going to taste like lousy vodka that's been flavored. Freshest, and best possible, ingredients: Fresh fruit, fresh herbs and fresh spices are all the best choice, and you will notice the difference. This is not the project to substitute frozen produce, and if you can get items that are in season and at the height of their flavor, all the better for this recipe too. I have used dried fruit in some cases, as a specific choice to go for that flavor, which also ended up working beautifully. Thoroughly clean and dry your chosen glass container. GATHER AND PREPARE YOUR DELICIOUS INGREDIENTS. Add fruit, spices, herbs or other flavoring ingredients. Use your judgement as to how strong the flavor of the ingredient is for how much you add. A good rule for fresh fruit is to fill the container half way up with the produce and then add liquor to fill the bottle. With herbs, a good handful or two should be plenty. With something strong, like ginger, a three inch piece should be enough for a 750ml bottle. Good quality vanilla beans should work with about four. You can always add more of the ingredients after a few days if you want a more pronounced flavor. Remember to cut the pieces small if you are using a small necked bottle, so you can remove them eventually and to give you more surface area in general, and know that they will expand as they soak up the alcohol. Peel fruit if you wouldn't generally eat the peel (i.e. mangoes and melons), with the exception of citrus, which have loads of very flavorful oils in their skin. Fill the rest of the container with the alcohol. Cover or cork the container, and allow it to sit and infuse for two to five days, in a cool place out of direct sunlight. This can be in the refrigerator, or simply on your counter, just not next to your stove. Occasionally tip the bottle gently to redistribute the alcohol. The longer you leave it, the more prominent the flavor, but it will level off eventually. When it has infused to your liking, you can strain it and transfer to smaller, prettier bottles. Most produce will breakdown and discolor eventually, so for gift giving or aesthetics, you may want to do this step. It is less necessary with vanilla beans, ginger, cinnamon, and spices. Store in a cool place, where you would other alcohol. It should keep for about a year. First, make sure all of your containers and ingredients are thoroughly cleaned. The high alcohol content should inhibit harmful bacteria from growing, but if at any point the concoction has an "off" smell, or starts to rapidly discolor or get cloudy, err on the side of caution and discard it. CITRUS: lemons, limes, grapefruit, oranges, and tangerines. But also meyer lemons and blood oranges, which are in season right now. VANILLA: About four whole vanilla beans, split down the middle. This is also wonderful with light rum. LEMON + HONEY: Add 1/2 cup of honey to a 750 ml bottle. FIG + CARDAMOM: An inspired combination that Marcus Samuelsson uses for Aquavit at his restaurant of the same name. Have some great flavor ideas? I'd love to hear them in the comments! Pomegranate, Dried Apricot, and Cranberry Vodkas. Hi Kay. My first and only experience with snake products was on that trip. But I’ll certainly report back if I come across other resources. Thanks! I love this! I’ve heard you can make delicious fruitcake (like lemon- vodka) with the fruit afterwards. The fruit would also be delicious on top of some ice cream for those of us who are insanely indulgent. I’m all about the flavored vodkas! I definitely need to venture out into making my own soon! Great to see you love vodka infusions as much as I do! Looks delicious. I want to do some infused vodka bottles for Christmas gifts in bottles the size of wine bottles that have a metal-clasp sealed closing. Will the fruit stay fresh in this type of bottle? Does anyone know??? One that Everyone will like is what i call berry juice. Fill mason jar up half full with cut strawberries add 3/4 cup sugar fill rest up with vodka. Put in closet for one month and shake every week. Strain out all particals. Taste just like straberry jam! I heard the idea for a Vodka Party years ago and I’m finally doing it!!!! Just like a cookie exchange but everyone brings jars, vodka and the infusions and we make it and exchange it!!!! I’ll let you know what people come up with! A couple of weeks ago, I debuted a strawberry & jalapeno infused tequila at my brother’s house amongst some friends. It turned out FANTASTIC and resulted in a perfect “sipping” tequila to be served on the rocks. We finished the entire bottle that night, so I’ll be doing a second larger batch. My current projects are a pistachio bourbon and a cucumber & mint gin. I’ve been a bartender for more than 10 years and have always loved it; infusing my own liquors has renewed my love for the industry tenfold.